Olympia Industrial Workers of the World – Page 5 – Fighting for the Working Class! The International Convention of the Industrial Workers of the World stands in solidarity with the resistance against the Dakota Access Pipeline. We call on the labor movement and working class to take a stand against enviromental racism and join the fight for a just transition as our collective future is at stake. We recognize that the capitalist system that oppresses the working class has always oppressed indigenous people of the world. Therefore we feel that settlers and indigenous workers should unite to take direct action against colonial industrial capitalism and do everything in our power to restore justice to indigenous people and Mother Earth. An injury to one is an injury to all. All IWWs and friends are requested to make the trip to Everett, Washington at 1:30 PM on Saturday, November 5th to commemorate the massacre of our members at that time and date in 1916. “Completing the Voyage” honors the 12 murdered and 27 injured Wobblies aboard the steamer Verona shot down by the sheriff and his drunken goons at 2 PM. Three hundred Fellow Workers were attempting to return to the city in northwest Washinton State to carry on with their free speech fight. As important as the centennial memorial is, the real goal is to let workers in the Everett area know that IWW is here. 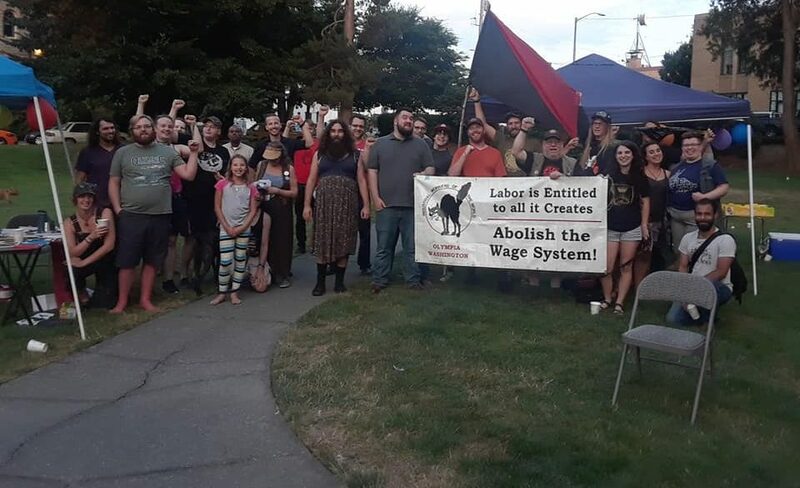 Whatcom-Skagit Branch is planning two public “Introduction to the IWW” presentations in Everett later in November; the town is ripe for reestablishing the IWW. We are hoping for cooperation and assistance from Vancouver, Seattle, Olympia, and Portland GMBs. The rally point is the west end of Hewitt Avenue, only 200 yards from the site of the murders. IWWs will lay wreaths and have a short ceremony, then walk seven blocks to “Speakers Corner” at the corner of Hewitt and Wetmore, where only days before the massacre IWWS were thrown in jail for asserting their right to free speech. We will soapbox about the modern IWW on the busy downtow street corner, and sing, too. The commemoration will end with a caravan 25 miles south to Seattle’s Mount Pleasent Cemetery where we will visit the gravesite of 3 of the 1916 victims, Fellow Workers Felix Baran, James Looney, and Hugo Gerlot. PLEASE COME! Everett will receive a lot of publicity from IWW prior to our event, and there may be a lot of local media attention. We need every Wob who can to come to Everett. For more information, contact the Whatcom-Skagit IWW branch: iwwbellingham@gmail.com. Traveling wobs are urged to make wreaths or large bouquets, or ask our branch to make one in your name. GMBs should bring their banners and IWW flags. Knowledge is the real power. Knowledge of the truth, that is. flowers, and live in health? Deny them access to truthful information. IWW branchs in the Northwest are hosting a campout in late August! See below for all the info! Group Camp Site #1 (NOT the Horse Camp). Check in at the main entrance, then drive around the Park to the north side, where the entrance to the Group Camp is. It is a forest service-type, steel bar gate, which the Advance Party will force open with C-4 charges, or just ask the Rangers for the key. We will make some pie-plate signage beginning at the crucial left-hand turn on Grace St. in Battle Ground (town), about 3 miles from the Park entrance. The Town is substantial enough to have a Clinic, diners, rib joints, drug stores, speakeasies, a Medical Cannabis dispensary, gun shops, major and minor grocery outlets, and a Rotary Club. If there is an American Legion post, we shall take appropriate measures to insure them that Wobblies Never Forget. $25.00 per tent, $10.00 per individual wanting to use 1 of 32 possible bunks. This is for the whole weekend, which is less than half of the full price for individuals or families. There are 4 Adirondack shelters, which are wooden structures with a roof and three walls. Bring firewood if desired, as there is a large wood storage shed for the main fire pit which is surrounded by benches. There are satellite fire rings near shelters, also three iron barbecues at one end of the picnic shelter. The site has its own shed with two vault toilets, which we will keep clean during our stay. Two water points, one with a garden hose hookup, the other with a drinking fountain-type faucet. The tent area is large and grassy (maybe 1/4 acre? ), and it is possible to find more secluded places to pitch a tent in the woods if one is more inclined to privacy. The whole site is tailor-made for convivial gatherings. The picnic shelter is big enough so that Vegans and FWs with special dietary considerations can set up their own kitchen and thus join in meals with their omnivorous Fellow Workers. No plans for a group kitchen or organized serving of meals have been made, so bringing enough of one’s own food is encouraged. The bunk rooms have no bedding, so please bring your own. No Wobbly will be turned away for lack of funds, nor shall they be mocked. The eponymous Lake is about a quarter mile long and oval shaped. Bring bathing suits; Naked Wobblies scare the Citizens. The Lake has trout stocked in it, but one needs a Washington State License to catch any, unless the Rangers can’t see your rebreathing equipment or hard-hat diving suits. Foot trails connect everything, and a map of the Park is available on the web site. Remember that no one will be turned away for lack of funds. For all payments, please follow up with an eamil to the Olympia GMB at OlympiaIWW@riseup.net and the Seattle GMB at SeattleIWW@gmail.com – showing the amount of payment and that it is for the campout. This is for financial transparency. The Organizer Training will be on September 8th & 9th, 2016. The cutoff to apply is August 31st to ensure we have enough food (light breakfast and lunch). Participants: 10 – 20 expected. 25 Max. Introduction: What is a Union? Welcome to the Olympia IWW Page! This is the first post on the Olympia IWW’s web blog. Look here in the future for news, articles relating to radical labor organizing and IWW history, and other interesting stuff pertinent to the One Big Union in Olympia, WA.